These days, most of the Android applications and games consist of too many ads which is quite frustrating for the user. While some of them can be turned off by using the application on Airplane mode but there are applications and games such as Clash of Clans or Graal Era which require Internet for the play. Lucky Patcher app is an android application which can remove ads, modify application permissions, bypass premium applications license verification, and do much more. You can also hack in-app purchases without paying anything in games such as clash of clans or Graal Era. Download Lucky Patcher APK from the link provided below. 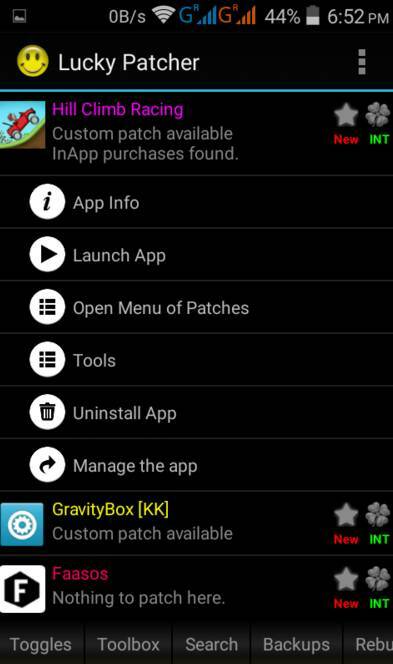 Once you’ve got the Lucky Patcher APK, Install it on your android device. Now, open Lucky Patcher and grant Root Access to your android device. Either close or Minimize the Lucky Patcher App and open the desired application in which you want to hack the in-app purchases or want to remove ads. Go to the store section of your desired app and try to buy anything. Once you’ll do this, lucky patcher window will open automatically. It will show you “Do you want to try to get this app for free?”. Click on “Yes”. Your application is now hacked. If your desired app is supported by Lucky Patcher, it will be successfully patched and your file will start downloading. NOTE: If the above steps are not working, proceed to the steps below for advanced patching of your app. Open Lucky Patcher App and search for Google Play Store. Select “Open Menu of Patches”. It’ll show you various lucky patcher custom patches such as clash of clash lucky patcher, graal era lucky patcher, google playstore lucky patcher etc. Select Playstore and then it’ll show you a warning message with “It is a system app”. Select “Ok”. Now, select “Custom Patches” and select “support.Inapp.LVL.android.vending” and click on Apply. Restart your Android device and then follow again from Step 1 to Step 7. You should also remember that you need to download Lucky Patcher Latest Version to avoid any issues. 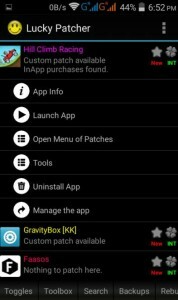 The latest version available is Lucky Patcher APK v7.1.0 which can be downloaded from the link provided above in this article. New host for auto-updates added. Get classes.dex for some corrupted apk files fixed. Added option for auto-launch for enabled app from widget “App disabler”. While you’re in the Step 9, when you’ll select the “Open Menu of Patches”, you’ll see list of your applications. Now, select your application and click “Create Modified APK File”. Now, if custom patch is available for that App, you can click on it as mentioned in the above steps. .If it is not available, click on”APK rebuilded for InApp and LVL emulation”. Click on “Rebuild the App”. If it shows you Pattern Success, click on “Go to file”. It will take you to the patched APK file of your app. Select your file and click “Uninstall and Install”. Once you’ve Uninstalled the app, you can click “Install” app from the menu in the above step. Your application is now patched without rooting your device. There are lots of Lucky Patcher Custom Patches available so you can search for a patch for your game. If you’re facing any issues while using this tutorial, kindly post in the comments below. Make sure you’ve downloaded the latest Lucky Patcher Apk v 7.1.0. If that game is a n offline one,then I can help. Download root explorer from its official website for free. If u download from google play store,then it will cost u money. Now open the app and then make the required change in the app’s core. Be careful, if only a character will be deleted or changed other than what I have mentioned above,then the whole app may stop. Do it at your own risk. Better have a backup of the app before doing anything like this. can i hack clash of clans with lucky patcher…..? i have tried several times as suggested in this site, but result still failiure…. how to upload my own custom patches to Lucky Patcher? I want to hack a game called Rush. It is showing custom patch by anonymous and not saying if it needs root or no. Pls tell fast. My device is not rooted.